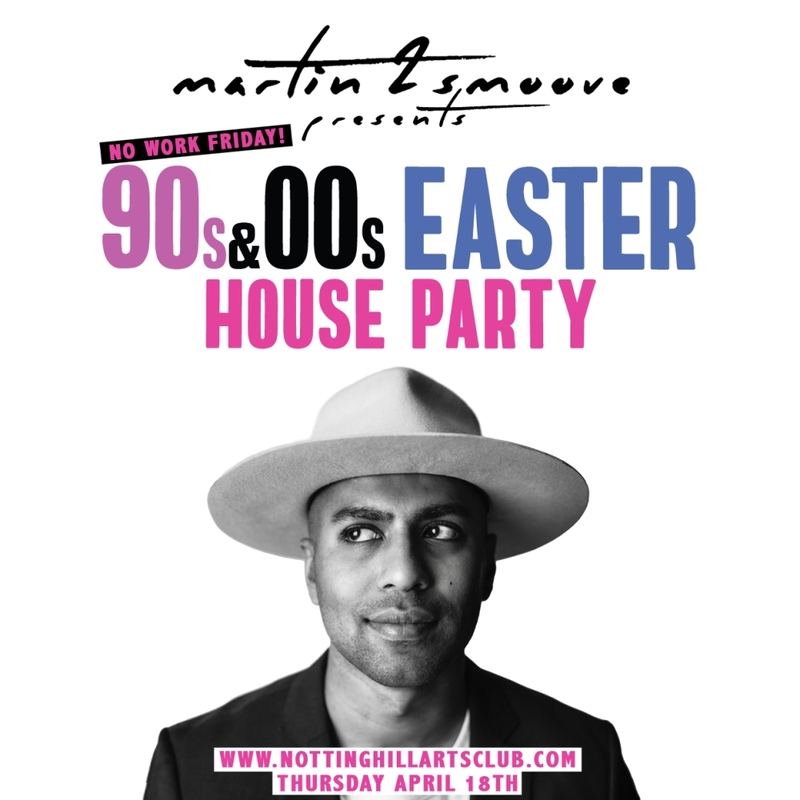 After a SOLD OUT New Years Eve Party, and of course the soon to be launch of his HollerBack Friday’s (going weekly) Martin 2 Smoove is back in the Notting Hill Arts Club to throw a All Out Easter House Party! Yes, Join us on Maundy Thursday for a House Party like never before spinning the very best in riddems from our golden age of music, the 90’s and 00’s all night long! Martin 2 Smoove is one of London’s Premier selectors and in demand club DJ’s. Winner of the London Bar and Club Awards Prize for best DJ last year, the crowd pleaser travels the world as both Grammy Award winner EVE’s Tour DJ And as the official DJ For Gumball 3000. Martin has a passion for HipHop and holds residences in some of the worlds best HipHop clubs. With Stints on both Radio 1xtra and Capital as Mix resident, Martin’s is capable of rocking any crowd and it’s no wonder he regularly entertains 10’s of 000’s at festivals with the likes of MTV and other huge brands! Martin will be joined by a selection of his DJ Friends on the night. We’ve got banging tunes, Popcorns, Love Slush Puppies, Cocktails (YES AMAZING 🔥COCKTAILS) Awesome Decor, Sick basement vibes and a line up of Stella DJ’s to keep you in motion all night long! Notting Hill Arts Club for years has been Unique & exclusive, yet creative and exiting venue, sharing its air with the likes of Kanye West, Lilly Allen, Mark Ronson, Trevor Nelson & of course Courtney Love. This party will play A BUCKET LOAD OF DRAKE! & loads of other tings, So come bling our hotline now…so yeah, theres something for bloody everyone..
Find us at: 21 Notting Hill Gate, London W11 3JQ We have no sign, just doors, we don’t do that.